Forrester Research earlier today put out its latest forecasts on online display ad spend, and the picture looks relatively positive for digital media: online display ad spend in the U.S. will reach $12.7 billion this year and will grow by 17% annually to be worth $28 billion by 2017, with CPMs almost doubling in that time to $6.64. But those numbers are still not big enough to offset declines in more traditional media in the area of “offline” display, with wider forecasts for U.S. display overall now being trimmed by 13%. Forrester doesn’t drill down into which companies are walking away with the biggest rewards in the online display advertising space, but a recent report from eMarketer predicted that in the U.S. it will be Google overtaking Facebook this year, with revenues of $2.31 million for Google compared to $2.16 billion for Facebook. That margin, it predicts, will grow even wider in subsequent years. The decline in U.S. display ad revenues are due to a couple of reasons, Forrester says. First, offline channels like radio, newspapers and yellow pages are all seeing less ad spend. While offline overall is declining by 1.1%, the brightest spot is in the area of cable TV, which will grow at 4.1% over the next five years. Secondly, in the pecking order of price pressure, cheaper social media display ad units are also now having a negative impact on other online spend. “Some of the decline can be attributed to the shift to less-expensive social media impressions, which weakens portals such as MSN and Yahoo,” write Joanna O’Connell, Niki Scevak, and Anthony Mullen, in the report. 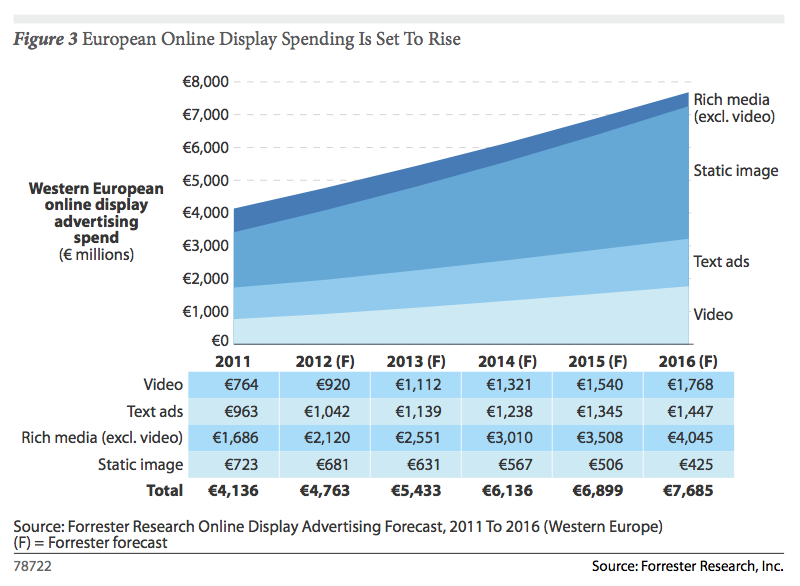 Meanwhile, over in Europe, the online display market is not only smaller but it is seeing slower growth compared to the U.S. Europe online display ad spend for 2012 will come in at €4.8 billion ($6.2 billion), and grow at a rate of 13% to be €7.7 billion by 2016. Whereas static images are declining to practically zero in the U.S., they are also declining in Europe, but not by nearly as much. 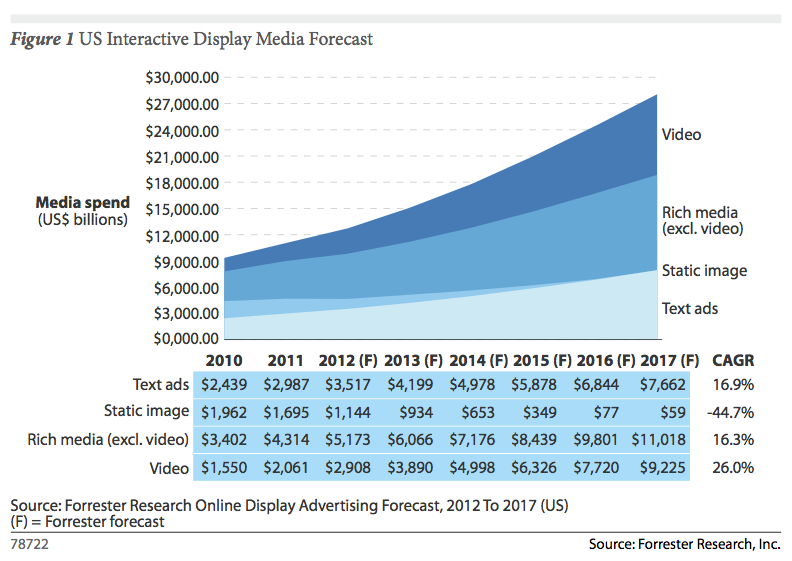 Similarly, text ads are continuing to show strong spend compared to newer ad formats: text ads and video-based ads are closer to being level in Europe than in the U.S. As with its North American counterparts, rich media ads continue to be the most popular format, and together rich media and video will account for 76% of all online display ad spend by 2016, up from 59% in 2011. And in another throwback to more traditional ad formats akin to those you might come across in newspapers or magazines, Forrester notes that large-format ad sizes are particularly popular in Europe. In fact, large-format is the one category where Europe seems to be outspending the U.S. at the moment. Among those ad buyers surveyed for the report, 63% say they use them or plan to use them. Forrester also notes that the rise of ad tech and more sophsticated formats are having a growing presence in the overall display ad market, although the impact of this has yet to be seen. Data targeting, real-time bidding, and placements that are similar to those that ad buyers can get on TV are all out there, but Forrester notes that so far many buyers aren’t biting.”The truth is, a lot of targeting options aren’t worth the money [today], and most of the ad formats are not interesting to consumers. Performance isn’t where it should be as a result,” notes Sam Bloom of Camelot Communications, in the report. Still, it points out that CPMs are actually on the rise. The average CPM — cost per thousand impressions — for 2o12 will be $3.17, but by 2017 that will rise to $6.64, largely because of the shift to real-time bidding and away from portal buys where placement is not guaranteed. The rise, the analysts note, is also a supply and demand issue: marketers are competing for similar audience segments and bid density is continuing to increase. As for TV-style placements, this is down to the fact that people are watching a lot more long-format video online. Forrester notes that long-format, ad-supported video watching is growing at a rate of 32%, compared to 18% for short form — although given that YouTube is still the reigning king of online video and most content there is of the short variety, it’s likely that short form is still outstripping long-form in terms of total views (although Forrester doesn’t drill into that data in this report).